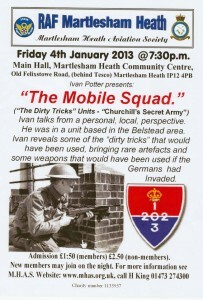 Tomorrow night at the Martlesham Heath Community Hall, Suffolk (Behind Tesco) the Martlesham Heath Aviation Society are holding a talk called “The Mobile Squad” Churchill’s Secret Army. Auxilier Ivan Potter will be talking about his time served in the Belstead Patrol. The talk starts at 7:30pm. Admission is £1:50 for members and £2.50 for non members. Call H King on 01473 274300 for tickets etc.